The transit system, which has gained approval from the cities of Oakland and San Leandro, will run from Oakland to the San Leandro BART station, primarily along International Boulevard and East 14th Street. Service is projected to begin in late 2017. In the meantime, these selected artists, who all have experience in public art projects, will begin collaborating with the agency to incorporate their works into the project. 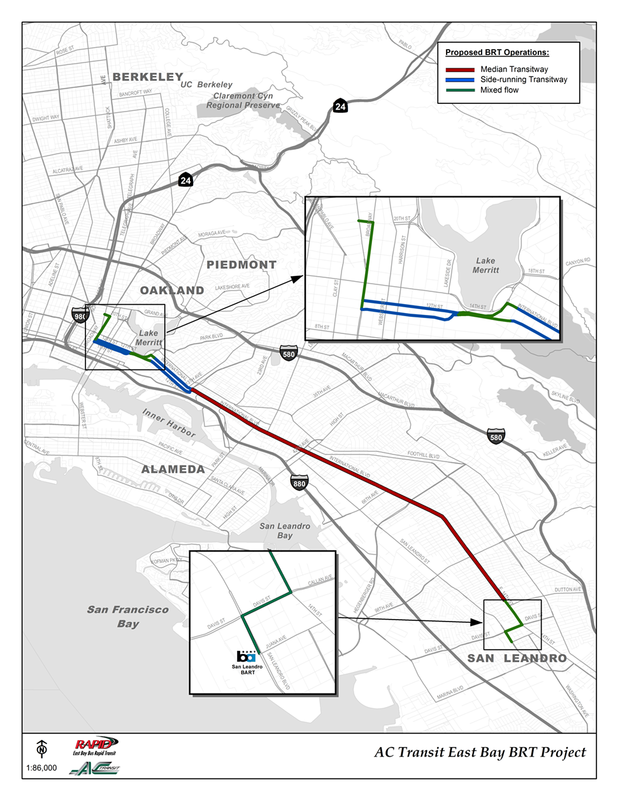 Construction of the the system, which officials are calling the East Bay BRT, is scheduled to begin in fall of 2015. (The public transit project is funded by Alameda County Measure B, Regional Measure 2 bridge toll funds, the state of California, and the Federal Transit Administration). A panel of art professionals and city and community representatives chose the winning artists from a group of semifinalists who had responded to a national call for lead and supporting artists that the agency put out last year. The art team will integrate works into the stations around a central theme of "Honor the Past and Celebrate the Future," AC Transit said in its announcement today. 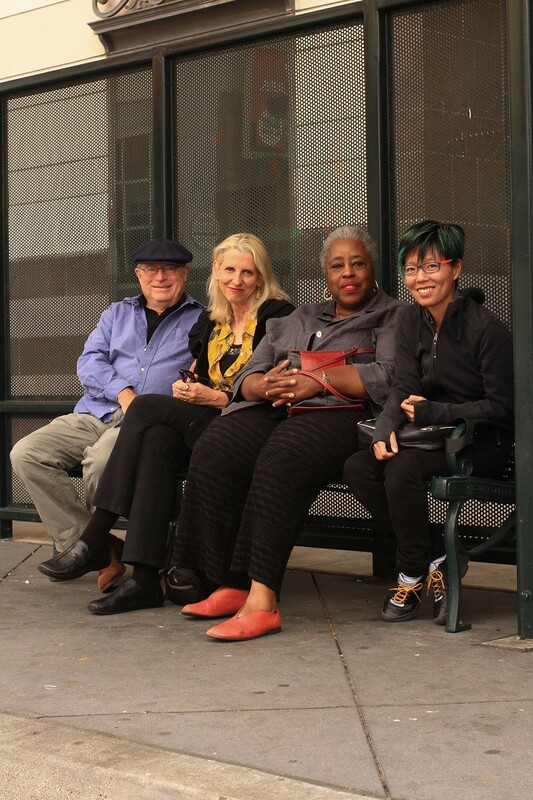 The agency will also host three workshops this spring along the planned East Bay BRT route, where members of the public can meet with the artists. “When this project is built, East Bay communities will enjoy state-of-the-art rapid transit bus service with artistically-enhanced stations that will enliven and upgrade the streets in every neighborhood touched by this project,” AC Transit Board President Greg Harper said in a statement. Map of proposed BRT operations. The chosen artists are behind a number of public art projects that are likely familiar to Bay Area residents. Poethig, an Oakland resident and professor at the visual and public art department at California State University, did a mural in downtown San Francisco for the International Hotel in Manilatown along with a ceramic tile installation at the 149 Mason Street Studios. Howard, a Berkeley-based artist, created Moving Richmond, a forty-foot steel work featuring poetry located at the Richmond BART station. Hsu has done a project at San Francisco International Airport, and Richards created the well-known Wave Organ sound sculpture on the San Francisco waterfront. Johanna Poethig is a Professor at the Visual and Public Art Department at California State University, Monterey Bay, and is an Oakland resident. Her recent projects include a public artwork for the new Pajaro Park in Monterey County, mosaic medallions for Hamilton Recreation Center in San Francisco and a sculptural installation at Starbird Youth Center in San Jose. Two of her previous major works of public art in downtown San Francisco are a mural for the International Hotel in historic Manilatown and a ceramic tile installation that wraps the eight-story 149 Mason Street Studios. Mildred Howard, a Berkeley-based artist, has received numerous awards for her critically acclaimed mixed-media and installation work, including an NEA Grant in Sculpture, Rockefeller Artist's Fellowships and the Joan Mitchell Fellowship. Her work is included in major collections, such as the San Francisco Museum of Modern Art and the de Young Museum in San Francisco and the New Museum in New York. Her work has also been widely exhibited internationally. Howard's Moving Richmond, a work in which a poem by Macarthur Fellow and poet Ishmael Reed was carved into a forty-foot piece of faceted steel mounted on the wall of Richmond’s BART Station. Joyce Hsu has received several public art commissions, including a major work at the San Francisco International Airport, and in the cities of Seattle and Cupertino. Her work will enhance upcoming projects for Sacramento’s light rail system and the new Kaiser Permanente Medical Center in Oakland. Peter Richards is the senior artist emeritus at the Exploratorium having worked with its founder Frank Oppenheimer to establish internationally recognized art programs, and serving as the arts program director through 1998. He is best known for creating Wave Organ, a wave-activated sound sculpture located on the San Francisco waterfront. Richard’s recent major work with Susan Schwartzenberg, Philosopher’s Way at McLaren Park was commissioned by the City and County of San Francisco. For more on the East Bay Bus Rapid Transit project, visit brt.actransit.org.